The world has failed to help survivors of the Bhopal gas leak in India 20 years ago or to punish the guilty, says an Amnesty International report. The report dated 29.11.2004 says- "Twenty years ago around half a million people were exposed to toxic chemicals during a catastrophic gas leak from a pesticide plant in Bhopal, India. More than 7,000 people died within days. A further 15,000 died in the following years. Around 100,000 people are suffering chronic and debilitating illnesses for which treatment is largely ineffective. The disaster shocked the world and raised fundamental questions about corporate and government responsibility for industrial accidents that devastate human life and local environments. Yet 20 years on, the survivors still await just compensation, adequate medical assistance and treatment, and comprehensive economic and social rehabilitation." Sunil Kumar, a survivor of the 1984 Union Carbide gas leak - and a victim, suffering serious mental illness in the 16 years since the disaster was found hanging from the ceiling of his modest home in Bhopal, the capital of India's Madhya Pradesh state, on the evening of 26 July. The end came without him realising his dream of seeing anyone brought to justice over the world's worst industrial accident. Satyanath Sarangi, president of the Bhopal Group for Information and Action (BGIA) and a close friend, says that Sunil felt strongly that people responsible for the gas disaster should be punished. In an interview in 1985, Sunil said: "The people must know who was responsible for the gas disaster - who killed their loved ones? "And those who are found responsible must be hanged. What is the use of all the money if those who have killed so many go scot-free?" 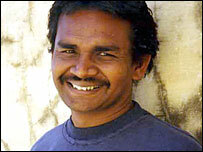 No one had faced trial over the leak by the time Sunil hanged himself. 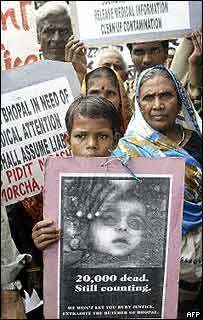 The Bhopal Disaster of 1984 is claimed by many as the worst industrial disaster in history. I just read about him. Sad to hear of the loss, and of the many others.